A perfect addition to any spooky celebration, we’re showing you how to create your very own Box Frame Wall Art just in time for Halloween! With the addition of twinkling fairy lights, this make is ideal for displaying around your home and it’s super easy to create too. 1. Print out your free template and adhere to your sheet of orange cardstock with washi tape to carefully cut out the pattern using a craft knife. 2. Remove your template and trim your paper to fit into the front of your frame. 3. Add your fairy lights inside the frame, leaving the switch on the outside of the frame so that you can turn the lights off and on as you wish. 4. Cut a piece of cardstock and black glitter felt to fit to the back of your frame. Adhere these. 5. Attach the back of the frame, making sure that you leave the ends of the fairy lights outside. Your wall art is now complete! 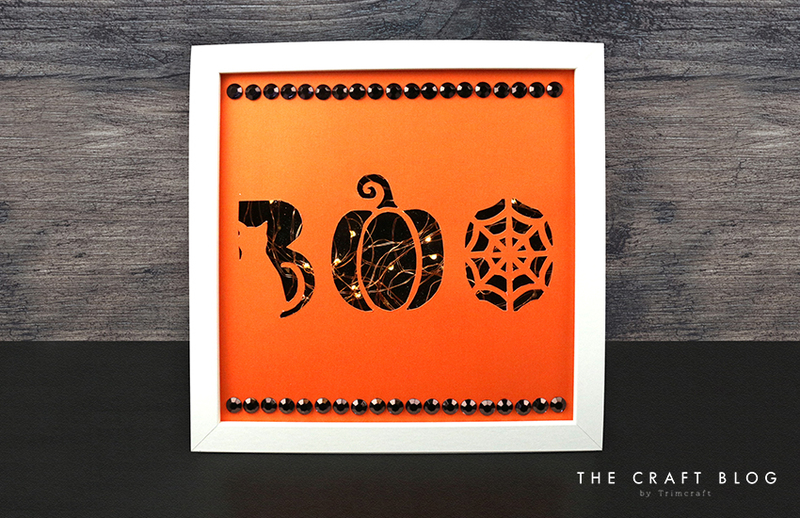 Will you be creating your own Halloween Wall Art? We’d LOVE to see, so don’t forget to #Trimcraft when uploading to social media and to share your projects in the Inspiration area. If you're stuck for ideas, why not take a look at our Top 10 Quick Halloween crafts for inspiration?